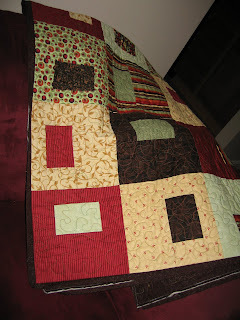 A Quilting Jewel: Binding's on!!! Jen it is beautiful, your color selection is great. I have had the hardest time finding the happy hour book. How about calling it "Bar Hopping"? or "The Bar Hopper"? After all, it is a happy hour quilt, right???? This is wonderful and I'm sure your Mom will love it!